Name honored by the Giants. John Joseph McGraw (April 7, 1873 – February 25, 1934), nicknamed "Little Napoleon" and "Muggsy," was a Major League Baseball player and long-time manager of the New York Giants. He was elected to the Baseball Hall of Fame in 1937. Much-lauded as a player, McGraw was one of the standard-bearers of dead-ball era major league baseball. Known for having fists as quick as his temper, McGraw used every advantage he could get as both a player and manager. He took full advantage of baseball's initial structure that only provided for one umpire, becoming notorious for tripping, blocking and impeding a baserunner in any way he could while the umpire was distracted by the flight of the ball. His profligacy in employing such tactics may have led to additional umpires being assigned to monitor the basepaths. However, even with his success and notoriety as a player, he is most well known for his record as a manager. His total of 2,763 victories in that capacity ranks second overall behind only Connie Mack; he still holds the National League record with 2,669 wins in the senior circuit. McGraw is widely held to be "the best player to become a great manager" in the history of baseball. McGraw's father, whose name was also John, and his older brother Michael immigrated from Ireland in 1856. He and his brother had arrived in time for the Civil War, and were drawn into the conflict as part of the Union army. Shortly after the war, he married and McGraw's older half-sister was born. John McGraw senior's first wife died, and he began moving around looking for work—a search that ultimately led him to Truxton, New York in 1871. It was there that the elder John McGraw married young Ellen Comerfort. They had the younger John McGraw on April 7, 1873. The younger John McGraw was named "John" after his father, and "Joseph" after his grandfather back in Ireland. Even as a baby, young Johnny (as he was called) had raven hair, and eyes so dark that many people thought they were black. The boy's birth was the first of many to the family, as seven more children were born over the course of the next 12 years. The sheer number of children, combined with the paucity of well-compensated work led to hard times for the large family. It was often a struggle simply to have ample food for everyone and clothing enough to protect them all from the harsh winters of upstate New York. Tragedy struck the family in the winter of 1884, when a debilitating fever swept through the family. Johnny's mother was the first to succumb, and his half-sister Anna, 13, died shortly thereafter. By the time the month of January in 1885 had passed, three more McGraw children had died. The devastated family moved from their house in the country into a hotel in town. Johnny's father, understandably bitter, heaped even more responsibility on the young boy's shoulders, and had very little patience for his son's passion for baseball. He became abusive toward the boy, and later on in 1885 (still only 12 years old), Johnny ran away. From that day onward, he was raised by a kindly neighbor, Mary Goddard, under whose care he did quite well. During his years as part of Mrs. Goddard's household, he took on several jobs that allowed him to save money to buy baseballs and the Spalding magazines that chronicled the rules changes in the rival major leagues of baseball, the National League, and the American Association. He quickly became the best player on his school team. Shortly after his 16th birthday, he began playing for his town's team, the Truxton Grays, making a favorable impression on their manager, Albert "Bert" Kenney. While he could play any position, his ability to throw a big curveball made him the star pitcher. It was McGraw's relationship with Bert Kenney that would precipitate his professional playing career. McGraw, then 23, married Minnie Doyle, the daughter of prominent Baltimore politician Michael Doyle, on February 3, 1897. This was at the height of his fame as a player for the old Baltimore Orioles of the National League. Two years later, while McGraw was on a road trip with his team, she developed appendicitis. An emergency appendectomy was performed, and McGraw was called back from Louisville, Kentucky. However, her condition worsened and, surrounded by not only McGraw, but other members of the family as well, young Minnie, only 23 years old, died on September 1, 1899. He married his second wife, Blanche Sindall, on January 8, 1902. She outlived McGraw by nearly 30 years, dying on November 4, 1962. Even after her husband's death, Mrs. McGraw was a devoted fan of the team he had managed for so long. In 1951, she threw out the first pitch during a World Series game in which her beloved Giants played the New York Yankees. Sadly for Mrs. McGraw, the Yankees won that day, 6–2, and would go on to win the championship—their third in a row—in six games. In 1923, only nine years before he would retire, McGraw reflected on his life inside the game he loved in his memoir My Thirty Years in Baseball. He stepped down as manager of the New York Giants in the middle of the 1932 season. 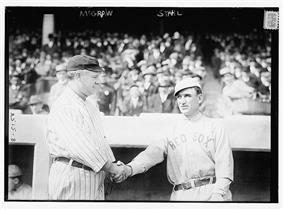 He was reactivated briefly when he accepted the invitation to manage the National League team in the 1933 All-Star Game. Less than two years after retiring, McGraw died of uremic poisoning at age 60 and is interred in New Cathedral (Roman Catholic) Cemetery in Baltimore, Maryland. Connie Mack would surpass McGraw's major league victory total just months later. After his death McGraw's wife found, among his personal belongings, a list of all of the African-American players he wanted to sign over the years, but was unable. In 1890, Bert Kenney bought a portion of the new professional baseball franchise in Olean, New York. 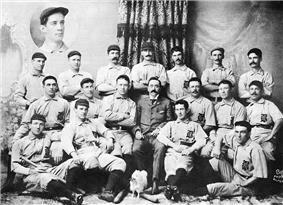 The team was to play in the newly formed New York-Pennsylvania League. In return for this investment, he was named player/manager of the team (this was called "captain" at the time). When McGraw heard the news, he immediately went to visit his former coach, begging him for a chance to play on the new team. Kenney had seen a lot of baseball by this time, and doubted that his former pitcher's one great pitch (the "outcurve," as it was called) would work as effectively against professional competition. Yet the man liked the teenaged McGraw very much, and when the boy insisted that he could play any position available, Kenney decided to give him a chance. McGraw signed his first contract to play professional baseball on April 1, 1890. [F]or the life of me, I could not run to get it. It seemed like an age before I could get the ball in my hands and then, as I looked over to first, it seemed like the longest throw I ever had to make. The first baseman was the tallest in the league, but I threw the ball far over his head. Seven more errors in nine more chances followed that day, a debacle that McGraw would not soon forget. After the team opened with no wins in six contests, Kenney and the other members of the ownership of the team—in the face of attendance that had dwindled to nearly nothing—were forced to overhaul the team. McGraw was given his release from the team, but Kenney also loaned him $70 and wished him luck if he wanted to try to catch on with another squad. McGraw could not bear the thought of going home a failure, as both his father and Mary Goddard had urged him to stay home and take a regular job, instead of chasing his dream of being a ballplayer. McGraw was resolute in his determination to make a name for himself as a professional baseball player, even if that meant struggling along in poverty for a time. Thus it was that he began his journey again, this time in Wellsville, New York, a team that played in the Western New York League. The level of baseball played there was the lowest of the minor leagues, and McGraw still struggled with his fielding. But during his 24-game stint with the club, he managed to hit .365, flashing a glimpse of what would later become his hitting prowess. On October 1, 1890, he finished his first season as a professional baseball player, still only 17 years old. After that first season, McGraw caught on with the traveling team of flamboyant promoter and fellow player, Al Lawson. Then only 21 himself, Lawson had gathered a ragtag group of players. These he took to Gainesville, Florida, in February 1891, hoping to play against major league teams who were training in the area. After defeating a team from Ocala a couple of times, Lawson began calling his team "the champions of Florida," and was able to convince the major league team from Cleveland to play against his team. It was during this game that McGraw gained his first notoriety as a player. The Cleveland squad was led by Denton True "Cy" Young, who had already become famous for his "cyclone"-like fastball. While the young Gainesville club lost the game 9–6, McGraw managed three doubles in five at-bats. He also scored half his team's six runs, crossing the plate three times. He played error-free defense at shortstop as well. Reports of the game—and his masterful play in it—made it to the Cleveland papers. McGraw's name began to become widely known after other daily papers as well as some national baseball weeklies, such as The Sporting News. Shortly (around a week), McGraw heard from many professional clubs requesting his services for the upcoming season. Lawson acted as the boy's agent and advised him to request $125 monthly and a $75 advance. The manager of the Cedar Rapids club in the Illinois-Iowa League was the first to wire the money and McGraw decided to make that his next stop. It was later claimed by several other clubs that McGraw had signed with them and had accepted their $75 advances. Though they threatened to sue, the clubs were never able to substantiate these claims and McGraw was allowed to play in the league. It was with the Canaries—as his Cedar Rapids club was called—that his greatest opportunity would arise. The Chicago White Stockings arrived in town for an exhibition game against McGraw's team. The White Stockings were led by Adrian "Cap" Anson, the major league's first true superstar. Unfazed by his famous opponents, the brash young McGraw led his teammates in giving their foes a hard time. During the game, on a field covered in mud, McGraw made a dazzling play at shortstop, leaping high to steal a hit from Cap Anson. After the game, Anson—impressed with the 18-year-old's solid play—asked him whether he would like to play for Chicago's team some day, which greatly increased the young man's confidence. 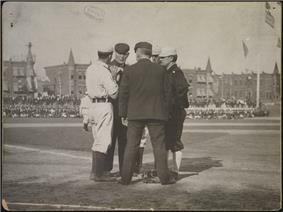 McGraw discusses an issue with an umpire and two members of the Philadelphia Athletics. When the call came for McGraw to report to the major leagues—the Baltimore club specifically—his teammates accompanied him to the rail station. McGraw arrived at Camden Station in Baltimore on August 24, 1891, still only 18 years old, but now a major league baseball player. McGraw described his new home upon his arrival as "a dirty, dreary, ramshackle sort of place." McGraw made his major league debut in 1891 in the American Association with the Baltimore Orioles. After the Orioles moved to the National League a year later, he remained with the team until 1899. During this time, McGraw established himself as an adept batsman with a keen eye, and an excellent third baseman. He walked over 100 times in a season three times, scored over 100 runs in a season five times, batted .320 or higher in every year from 1893 on, and also boasted an on-base percentage of .400 or higher in every year from 1893 on, including a career high mark of .547 in 1899. McGraw also took on managerial duties for the 1899 Oriole team and posted an 86–62 record. McGraw's playing time diminished over the following years as he played for the St. Louis Cardinals (1900), the American League Baltimore Orioles (1901–1902) and the New York Giants (1902–1906). 1902 was his last season as a full-time player; he never played in more than 12 games or tallied more than 12 at bats in any season thereafter. He retired having accumulated 1,024 runs, 13 home runs, 462 RBI, a .334 batting average and a .466 on-base percentage. His .466 career on-base percentage remains third all-time behind only baseball legends Ted Williams (.482) and Babe Ruth (.474). Despite great success as a player, McGraw is most remembered for his tremendous accomplishments as a manager. In his book The Old Ball Game, National Public Radio's Frank Deford calls McGraw, "the model for the classic American coach—a male version of the whore with a heart of gold—a tough, flinty so-and-so who was field-smart, a man's man his players came to love despite themselves." McGraw took chances on players, signing some who had been discarded by other teams, often getting a few more good seasons out of them. Sometimes these risks paid off; other times, they did not work out quite so well. McGraw took a risk in signing famed athlete Jim Thorpe. Alas, Thorpe was a bust, not because he lacked athletic ability, but because "he couldn't hit a ball that curved." McGraw was one of the first to use a relief pitcher to save games. He pitched Claude Elliott in relief eight times in his ten appearances in 1905. Though saves were not an official statistic until 1969, Elliot was retroactively credited with six saves that season, a record at that time. Over 33 years as a manager with the Baltimore Orioles of both leagues (1899 NL, 1901–1902 AL) and New York Giants (1902–1932), McGraw compiled 2,763 wins and 1,948 losses for a .586 winning percentage. His teams won 10 National League pennants, three World Series championships and had 11 second place finishes while posting only two losing records. In 1918 he broke Fred Clarke's major league record of 1,670 career victories; he was later passed by Mack. 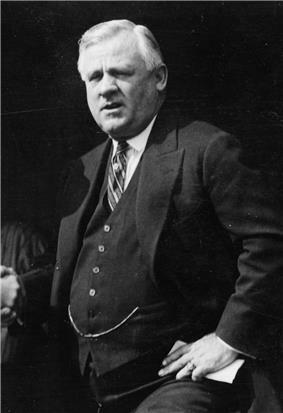 McGraw led the Giants to first place each year from 1921 to 1924, becoming the only National League manager to win four consecutive pennants. At the time of his retirement, McGraw had been ejected from games 131 times (at least 14 of these came as a player). This record would stand until Atlanta Braves manager Bobby Cox broke it on August 14, 2007. In 1919, McGraw became a part-owner of the Giants when Charles Stoneham bought the club. As part of the deal, he became vice president of the Giants, with complete authority over the baseball side of the operation. However, he'd had more or less a free hand in baseball matters since his arrival. McGraw wrote an autobiography of his years in baseball, published in 1923, in which he expressed grudging respect for several opposing players. He retired as manager midway through the 1932 season, but returned to manage the National League team in the inaugural 1933 All-Star Game. 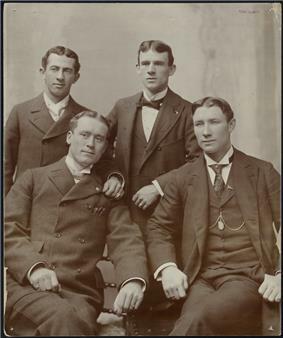 Although for most of his career McGraw wore the same baseball uniform his players wore, he eventually took a page out of Mack's book toward the end of his career and began managing in a three piece suit. He continued to do so until his retirement. McGraw was inducted into the Baseball Hall of Fame in 1937; his plaque stated that he was considered the greatest assessor of baseball talent. In honor of the days he spent coaching at St. Bonaventure, St. Bonaventure University named its athletic fields after McGraw and his teammate, fellow coach and fellow Hall of Famer Hugh Jennings. Although McGraw played before numbers were worn on jerseys, the Giants honor him along with their retired numbers at AT&T Park. The John McGraw Monument stands in his hometown of Truxton. Alexander, Charles C. (1995). John McGraw. U of Nebraska Press. Threston, Christopher (2003). The Integration of Baseball in Philadelphia. McFarland. Markoe, Arnie. The Scribner Encyclopedia of American Lives. ^ Alexander, Charles (1995). John Mcgraw. Lincoln: University of Nebraska Press. ^ "Manager McGraw's Wife Dead" (PDF). The New York Times. 1899-09-01. Retrieved 2008-07-28. ^ "Mrs. John J. McGraw, 81, Dies". Archives. The New York Times. 1962-11-05. Retrieved 2008-07-28. ^ "Mrs. John McGraw, Wife Of Former Giant Manager, Tossed Out First Ball", by Whitney Martin, for The Hartford Courant, 6 October 1951. ^ a b Mcgraw, John (1995). My Thirty Years in Baseball. Lincoln: University of Nebraska Press. ^ "John McGraw Long Baseball Leader Dies", The Hartford Courant, 26 February 1934. ^ Graham, Frank (2007). Mcgraw of the Giants – an Informal Biography. City: Chauhau Press. ^ a b Deford, Frank (2006). The Old Ball Game. New York: Grove Press. ^ Morris, Peter (2006). A Game of Inches: The Game on the Field. ^ McNeil, William (2006). The Evolution of Pitching in Major League Baseball. ^ Bios Of The Inductees. Irish American Baseball Hall of Fame website. Retrieved 2014-02-23.